Offal—tongue, tripe, heart, even face, among other so-called off cuts—happens to be one of my favorite things to eat. As with most of my stranger culinary predilections, I blame it on my old man who always made sure to include plenty of hearts whenever he cooked up a batch of chicken soup. Thus I present a list of some of my favorite nasty bits. Husband and wife offal slices at Golden Mall. Almost every ethnic group residing in the multicultural culinary wonderland of Queens has its own take on tripe. 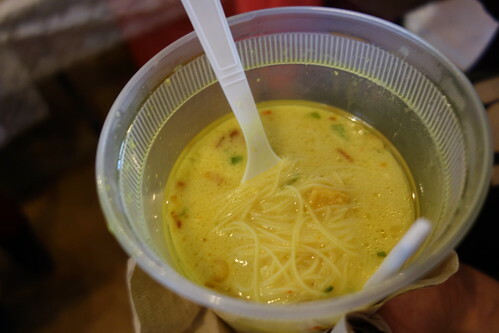 From sheets of omosa floating in Vietnamese pho to fiery Sichuan fu qi fei pian to Filipino goto, I love them all. The other night I found myself in Himalayan Heights and decided to have a plate of dhopa khatsa, a spicy Tibetan preparation. When the dude at Namaste Tashi Delek Momo Dumpling Palace, a spot that serves food from Nepal and Bhutan as well as Tibet, brought over the steaming tangle of guts flecked with red pepper I dug in with gusto. As my palate warmed and my brain thawed out, inspiration struck. “Can I have a tingmo?” I asked. When he brought over the steamed white bun, I proceeded to cut it in half and assemble the first ever Tibetan tripe sandwich in New York City. It was a nice idea, but after the first bite or two the bun gave weigh under its offal-laden freight. The pillowy tingmo ($1) made for a good textural contrast to the chewy ribbons of dhopa khatsa ($6). And the swatches of dough were great to swipe through the fiery sauce. Last Saturday I still had a whole hog hangover and had a food tour to lead, so I knew there was no chance I’d be able to attend the Forest Hills Indonesian Food Festival, even though it was practically in my back yard. So I’m very glad that my pal Peter Cucè agreed to do a guest post about it. Peter Cucè is a food-obsessed coffee lover who intermittently chronicles New York City cafe culture via a variety of internet outlets. He has eaten his way through nearly every cuisine available locally and beyond and is now systematically working his way through regional Chinese and Korean food in Flushing and Sunset Park and cataloging his efforts via Instagram. You can also catch Peter on Twitter @petekachu. Take it away Peter . . . The Queens-based southeast Asian food festivals have been coming thick and fast now that spring has sprung, beginning with the mid-April Songkran New Year festival at the Thai temple in Elmhurst, followed a week later (Sunday April 21st) with the inaugural 2013 date of the monthly outdoor Indonesian food festival at Astoria’s Masjid Al Hikmah, and Myanmar’s Lunar New Year fair rounding out the month. May hasn’t been slouching in this department either, with this past weekend seeing another Burmese festival, one that happens periodically in the warmer months, at Aviation High School; a one-off Indonesian food festival this past Saturday, a fundraiser for the Roslin Orphanage in Kupang, Indonesia, held at the First Presbyterian Church of Forest Hills; and this coming Sunday, the second iteration of the monthly Indonesian mosque festival held in the parking lot behind Astoria’s Masjid Al-Hikmah. 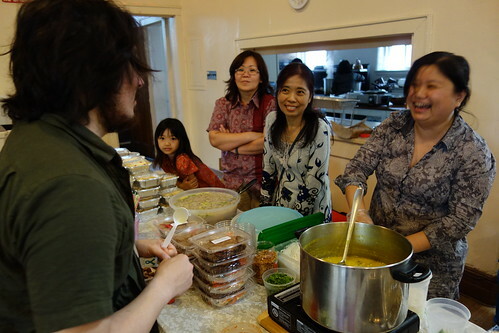 Besides being indoors, compared to the monthly mosque festival, this past weekend’s Indonesian event was conceptually different, because pork was on the menu. Although Indonesia is predominantly Muslim, Christians make up around 10% of the population. The church vendors were mostly Javanese/Chinese, while the people cooking at the mosque tend to be Sumatran, although there are also some Javanese at the mosque and vice versa. This ethnic religious influence reflects on the food available at each event, with the church’s Central Java leanings generally resulting in overall sweeter food, seasoned with kecap manis (sweet soy sauce) and palm sugar, compared to the mosque, where dishes tend to be spicier and more savory, with flavor enhancers such as shrimp paste. One major exception is the sate padang, a well-known Sumatran dish, which is almost always available at the mosque event and was notably available at the church, as I’ll get into a little more below. 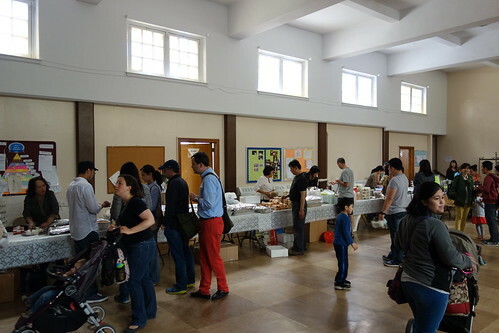 Since there wasn’t anywhere for the participants to do more than the most rudimentary cooking (in actuality just reheating), this event for the most part offered food cooked ahead time and assembled at the church, whereas at the mosque a good portion of the food is cooked from scratch on site. Once my Indonesian posse and some other friends arrived, we armed ourselves with $20 or so worth of tickets each and spread out, hunting for tasty items and bringing them back to the group for sharing, a useful strategy for trying lots of things without getting full too quickly. Last week I received quite an honor, a recognition of my work if you will. Alas, it was not a James Beard Award. Nor was it another television appearance, although I do have one coming up February 27 at 9 p.m. on the Travel Channel. No, this was a far greater mark of prestige than any medal or TV spot. The TripeMarketingBoard (@TripeUK) followed me on Twitter in response to a post about the Sichuan dish fu qi fei pian. They also sent along a link to the fascinating film above: Marketing Tripe: a Brief History. I was especially intrigued by an old-timey still of an Italian eatery called Antonia’s Tripe & Pasta Hut. Along with such slogans as “Tripe for Stamina,” the whole thing seems fake. It is in fact quite legitimate as a Google search for the Lancashire–based Tripe Marketing Board reveals. And yes, there was an Antonia’s where they served pizza topped with reticular tripe, which is something I’d like to try. There is one thing that I am sure does not exist though, a Chinese Tripe Marketing Board. Hly’s fu qi fei pian is quite the harmonious marriage of offal. With its ribbons of tongue and tripe slicked with chili oil and romantic back story, fu qi fei pian is one of the most intriguing and delicious cold Sichuan dishes out there. I honestly forget whether I read it in one of her books or whether she told me on a visit to Golden Shopping Mall, but Fuchsia Dunlop says it gets its name, “husband and wife offal slices” from an especially happy couple who created the dish many years ago in Sichuan. It is commonly listed on menus as ox tongue and tripe in pepper sauce, perhaps to avoid tasteless jokes about cannibalism. There are almost as many versions of this dish in Flushing’s Chinatown as there are Chinese restaurants. The one that makes me happiest these days can be found at at Hly, a newish spot on the southern end of Main Street. Strewn with peanuts and bits of greenery it is plenty spicy but not ridiculously so. Consider it a more refined take on a Chengdu street food classic. Or perhaps an offal lover’s version of the American Chinese stir fry, Happy Family.